This level of the course is open to the general public and serves as a highly valuable self-development outlet, a general interest course and a stepping stone to continue studying to Level II, the Diploma in Clinical Hypnotherapy. Upon completion of this course the graduate will receive an ICHP Foundation Certificate in Clinical Hypnosis. In 2003 the Institute of Clinical Hypnotherapy & Psychotherapy was invited to become a founding member of the European Association of Hypnotherapy & Psychotherapy because of its ongoing Master Programmes focusing on Hypno-analytical Psychotherapy. Frans Peeters (Netherlands) invited the Institute of Clinical Hypnotherapy and Psychotherapy to become a FOUNDING MEMBER of the EAHP. In order to maintain this high standard of Post Graduate training, the ICHP Master Programme has developed specific modules over a four year period designed to meet the needs of the international register for evidence-based hypnotherapy. Dr Peter George of ICHP Australia in connection with ICHP Ireland has developed a Master Programme that meets the criteria of Evidence-based Hypnotherapy / Hypnopsychotherapy. This four year programme is open to all ICHP Graduates and suitably qualified psychotherapists who have completed the undergraduate programme and the upgrade programme. Please go to the Master Programme section of the website for more information. This Foundation Certificate course is designed for the student to learn the basic skills of Hypnosis/Hypnotherapy while providing an excellent stepping stone to the Diploma and Advanced Diploma Levels. The student will learn about Hypnotherapy and how to induce therapeutic trance in their clients to help with presenting symptoms such as smoking, slimming, stress, phobias, fears and anxieties, pre-exam nerves, concentration and memory improvement. This course combines hands on practical course work with course notes, audio recordings and a required reading list, all of which help the student accumulate the basic skills of a Clinical Hypnotherapist. The course requires 56 hours of practical training which takes place over four weekends, with each weekend contributing towards 14 hours of training. The student will discover the many advantages of training in Hypnosis and therapy before committing to the ICHP Diploma in Clinical Hypnotherapy and Psychotherapy. The course will also teach the student to deal with personal issues, realise their true potential and help focus on a successful future career in Hypnotherapy-Psychotherapy. During Level 1 there’s a strong emphasis on continuous assessment and Supervision and the student is encouraged to practice with family & friends as practice clients. On completion of Level 2, the Diploma in Clinical Hypnotherapy, the student will be eligible to go into professional practice in Clinical Hypnotherapy using suggestion therapy. What is Psychotherapy: A personal and practical guide. During the ICHP Foundation Level there is a strong emphasis on the ICHP Code of Ethics, Standards & Practice in order to train the student in all issues relating to practice and ethical Hypno-psychotherapy. The Diploma in Clinical Hypnotherapy is available to students who have successfully completed the Foundation Certificate in Clinical Hypnosis. This part of the course builds on the principles, practice and Ethics of Clinical Hypno-psychotherapy. The student is required to attend 84 hours of practical training, which is run one weekend a month for six months. This course also involves twelve lessons and recorded lectures for directed independent learning. Lessons will be supplied from initial application on the course as well as during the weekend practical. Assessment involves exercises, exams and essays, along with practical experience. Required home study consists of a recommended reading list in addition to the manuals provided. Students are required to submit range of learning assignments. The Inter-relationship of Conflicts with sexual problems and anxiety states. Each Student is required to begin Personal Therapy and analysis in their Diploma year. ICHP will provide a list of suitable therapists who are accredited to conduct personal therapy on ICHP students. Each student should maintain a journal that monitors their own self-development and enter the hours taken and their self-development in their log Book. Each graduate of the ICHP Diploma Course will be eligible to secure Public Liability Insurance and Private Indemnity Insurance with Holistic Insurance Services which will provide cover when in practicing as a Clinical Hypnotherapist. In order to practice as a Clinical Hypno-psychotherapist it is necessary to continue to the next stage of the programme, the Advanced Diploma Practical classes. The requirement for this level of the programme is to conduct 56 hours of practical training, held over 4 weekends once a month. Again there are various examinations and essays throughout the course. On completion of your Foundation, Diploma & Advanced Diploma courses and the required assessments, you are eligible to receive your Advanced Diploma in Clinical Hypnotherapy & Psychotherapy. This allows you to become a member of the ICHP Post-Graduate Association and to go into practice as a Clinical Hypnotherapist-Psychotherapist. The course syllabus is laid out below – briefly, the course covers all aspects of Clinical Hypnotherapy / Hypnosis / Psychotherapy & Hypno-analysis, so that upon graduation you will be in a position to set up in private practice, and start your new career as a professional, ethical, accredited and competent Hypnotherapist / Hypno-analyst / Hypno-psychotherapist. Personality Theory in Hypno-psychotherapy which deals with the development of a basic understanding of the various theories of Personality development and their relevance to Hypno-psychotherapeutic analysis. General Human Sciences workshop which lays the scientific foundation in Human Anatomy and Physiology, Neuro-science, the Emotional Limbic system, Left and Right brain processing, State Dependent Memory Learning & behaviour, Evolutionary development, the Threat system, Stress and Core Psychotherapy Modules. ICHP Accreditation BCHAPS Techniques Workshops are run one weekend each month for 10 months. Participants are required to: attend ten of these weekends which run on a Friday evening/Saturday basis in Dublin, and once a week in Cork. Each weekend will involve specific techniques which will be repeated at intervals over the 24 months, so that, in the event of a participant missing one weekend, they will be eligible to complete it in the next cycle of workshops. 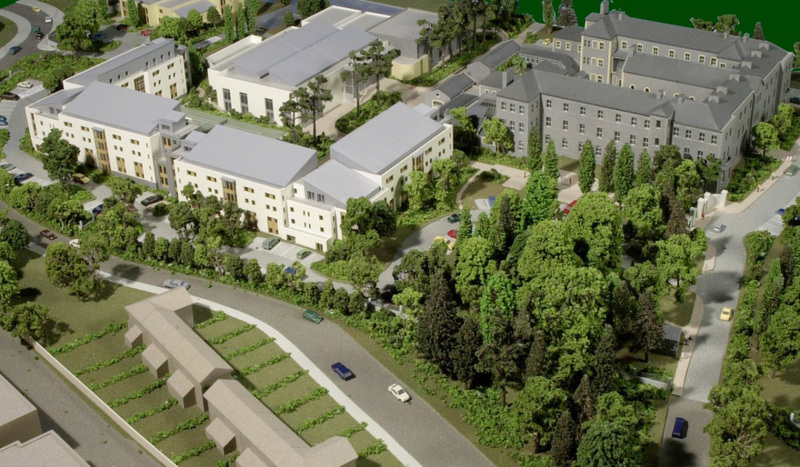 In addition the student will have to conduct Work Experience in the area of Mental Health. PROGRAMME BACKGROUND ICHP is proud to be one of the founding members of the European Association for Hypno-Psychotherapy, with it’s unique Hypno-psychotherapy model, BCHAPS which means Brief Clinical Hypno-analytic Psychotherapy. 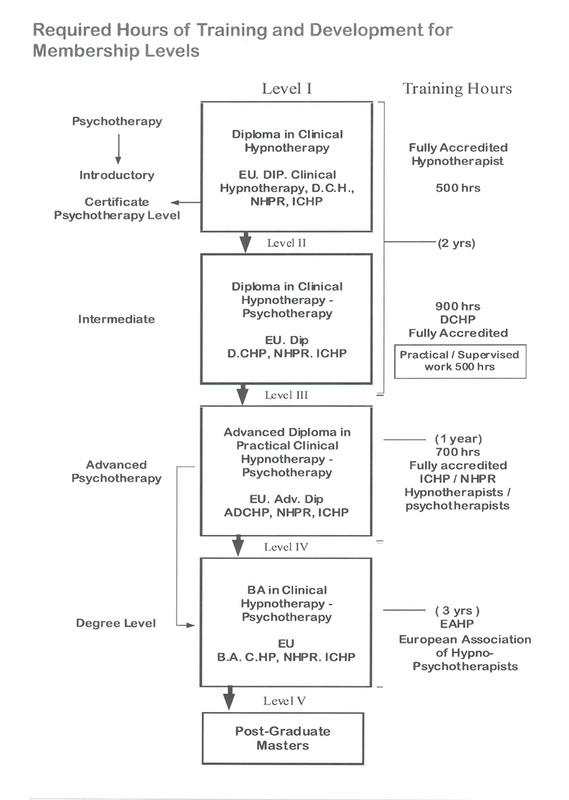 In 2009 the ICHP Training & Accreditation Institute gained some major ground on the road to European-wide Accreditation by attaining Category 4 Membership of the European Association for Hypno-Psychotherapy (EAHP). This category of membership is the ‘gold standard’ of European education in Hypno-psychotherapy and allows for accreditation on a European recognised level. ICHP Training and Accreditation Institute are currently planning to roll out a new Degree Upgrade Programme for current graduates. These programmes will be split into undergraduate and postgraduate levels, with the former leading students to an ICHP Degree in Hypno-psychotherapy and the latter to a Masters award. The undergraduate level will require students to complete three years training to achieve the Associate Degree Level. ICHP are now offering current ICHP therapists and graduates the opportunity to complete a one-year training programme to upgrade their qualifications to this Associate Degree Level, and to have the opportunity to continue into Post-graduate training thereafter. The course will entail further supervision, clinical practice and personal therapy. The new training programme for present graduates is created to fulfil the requirements of Clinical Practice and Hypno-psychotherapeutic experience which are major facets of the EAHP training standards. Hence, the programme will involve each student both performing and receiving a variety of Hypno-psychotherapeutic techniques in a supervised setting. RATIONALE The rationale behind this methodology is that in receiving the techniques the participant is receiving personal therapy, while, in performing the techniques the participant is gaining clinical practice experience. Research shows that, whereas good knowledge of key components of a technique lays an important foundation for effective practice, expert practitioners are those who are able to adapt the technique to deviate and go beyond the technical recommendations of the technique when the clinical situation requires this. ICHP’s one-year programme for graduates entails Supervised Techniques Experience in Clinical Practice, Personal Hypno-psychotherapeutic Experience, Case history writing and Journaling. All of these modalities are essential for successful practice in Hypno-psychotherapy. The objective of these classes is that the participant will be practicing each technique four times and receiving the technique four times. As various techniques are covered each weekend, the course format allows the techniques to be run cyclically. Therefore, if a participant is unable to attend one weekend they can cover the techniques they have missed in the second cycle of classes. Each class will see students learning various techniques and then both performing the technique on fellow students and receiving the technique from fellow students, all the while being Supervised and assisted by senior ICHP Supervisors. This will contribute to your ability as a therapist to perform and practice each technique under Supervised Techniques Experience and to undergo each technique for yourself as a form of Hypno-psychotherapeutic Experience. The directed independent study section of the course entails documenting experiences through case history writing and journaling issues arising as a result of receiving the technique. On completion of the Supervised Techniques Experience in Clinical Practice integrating Personal Hypno-psychotherapeutic Experience, Case history writing and Journaling students will be eligible to continue their studies into Post-graduate Level which runs part-time for four years.